A video of the massive task can be found at the bottom of this page. 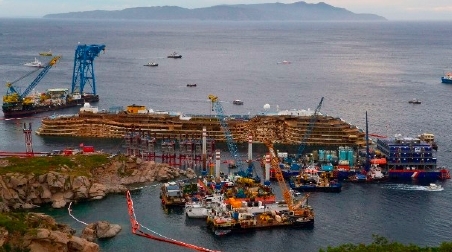 Today, engineers have succeeded in righting the Costa Concordia. Using massive pulleys, cables and steel tanks, the 500-person salvage crew from 26 countries rolled the 114,000-ton vessel off the rocks on which it had rested since it ran aground. “It was a perfect operation, I would say,” said Franco Porcellacchia, the head of the technical team for the cruise line. awaiting starbord side sponsons and flotation. from where it lay on two underwater rocks. The effort began at 9 a.m. yesterday. By midnight, despite delays caused by thunderstorms and the need to tighten a slack cable, the ship had been hauled off the rocks and upward about 25 degrees. That was far enough for the salvage crew to start drawing water into massive steel boxes attached to the exposed side of the hull and then use the weight of that water to finish rolling the hulk onto a steel platform built off the sea floor. Four hours later, the wrecked ship was resting on the platform, said Franco Gabrielli, the head of Italy’s Civil Protection Authority. Once the ship was righted, a slashing, diagonal line could be seen separating the white paint of the exposed hull from the brownish muck that had collected on its starboard side. There appeared to be no sign of leaks, Gabrielli told reporters – a promising sign, as the wrecked liner is full of spoiled food, paint, lubricants, insecticides and other toxic items (see below). “The sides of the ship will need major work and repair, but today we have really taken a clear step to allow the ship to be taken away,” Gabrielli said. Yesterday’s process, known as parbuckling, was the first step in the plan to remove and scrap the 952-foot ship. 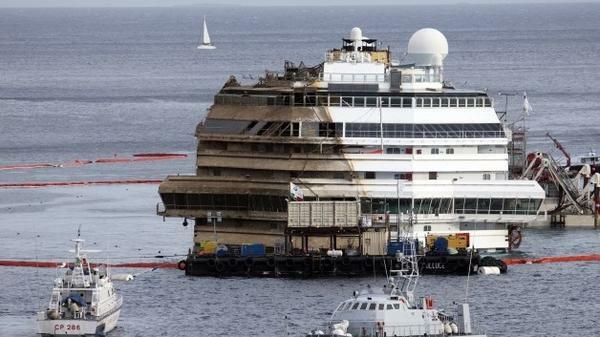 The Concordia was rotated onto giant platforms 30 meters (about 98 feet) below the water level, which leaves parts of the ship that have been dry for months submerged and filled with water. No ship this large or heavy had ever been parbuckled before. Normally, crews would have blown up the ship or taken it apart on site – a cheaper route than what’s being done now. 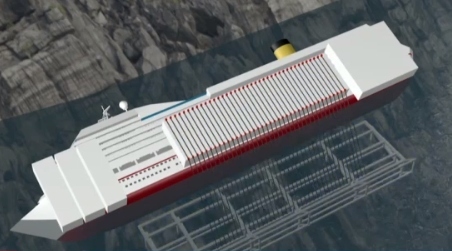 But officials say that wasn’t an option with the Costa Concordia, because the ship is filled with noxious substances (see below) and because two bodies are believed to be either trapped beneath or inside the ship. Hundreds of people and dozens of companies have collaborated on the preparations, but the parbuckling came down to 12 people, including salvage master Sloane and specialized technicians, who guided the operation from inside a prefabricated control room set up on a tower on a barge in front of the ship. In preparation, towers were also anchored onto the rocky shore and fitted with computer-operated pulley-like wheels. When the rotation began, the wheels guided thick cables and chains that pulled the middle third of the ship from under its belly toward Giglio. At the same time, more chains and cables attached to the sponsons welded onto the ship’s port side pulled the ship from the top toward the open sea. The salvage operators had also set up two rings of oil booms equipped with sponges and skirts that extend into the water, in case the ship should break apart in the process, causing its toxic contents to spread out into the ocean. Thousands of liters of lubricants, paints, insecticides, glue and paint thinners as well as 10 tanks of oxygen and 3,929 liters of carbon dioxide. Refrigerators filled with milk, cheese, eggs and vegetables have been closed tight since the disaster, but they’re in there. The freezers that remain intact contain the rotting remnants of what were once 1,268 kilograms of chicken breasts, 8,200 kilograms of beef, 2,460 kilograms of cheese and 6,850 liters of ice cream. Much work remains. A robotic submarine equipped with surveillance cameras will survey the damaged side of the ship and create models needed in planning for the attachment of more buoyancy chambers (called sponsons) to the starboard side. 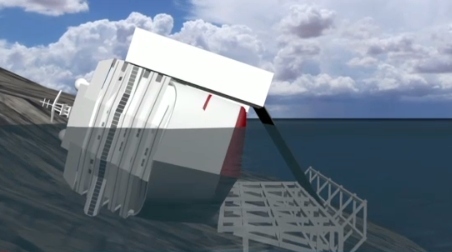 Once those are installed, water will be pumped out of the sponsons to refloat the vessel. Organizers expect the ship won’t be towed away for dismantling until the summer of 2014. Tuesday’s predawn accomplishment was met with applause from the people of Giglio, a tiny island that was transformed by the disaster. “We are not at the end of the operation, but this is a very important achievement,” Giglio Mayor Sergio Ortelli said. The wreck killed 32 of the 4,200 people on board. And the remains of two of them, Russel Rebello of India and Maria Grazia Trecarichi of Sicily, could not be found. Rebello, 33, was a cruise waiter who was last seen helping passengers off the ship. Trecarichi was on the cruise to celebrate her 50th birthday with her 17-year-old daughter, who survived. Eventually, in November, 2013, Trecarichi’s remains were positively identified, and she was finally buried. The location of Rebello’s body is still unknown.